This is the red version of the tailfin for VFA-31 'Tomcatters'. This is the color version of the current squadron patch for VFA-31. However, it has no words --- does it really need any?! The mascot is perhaps one of the most well known in the world. Great collectors item. 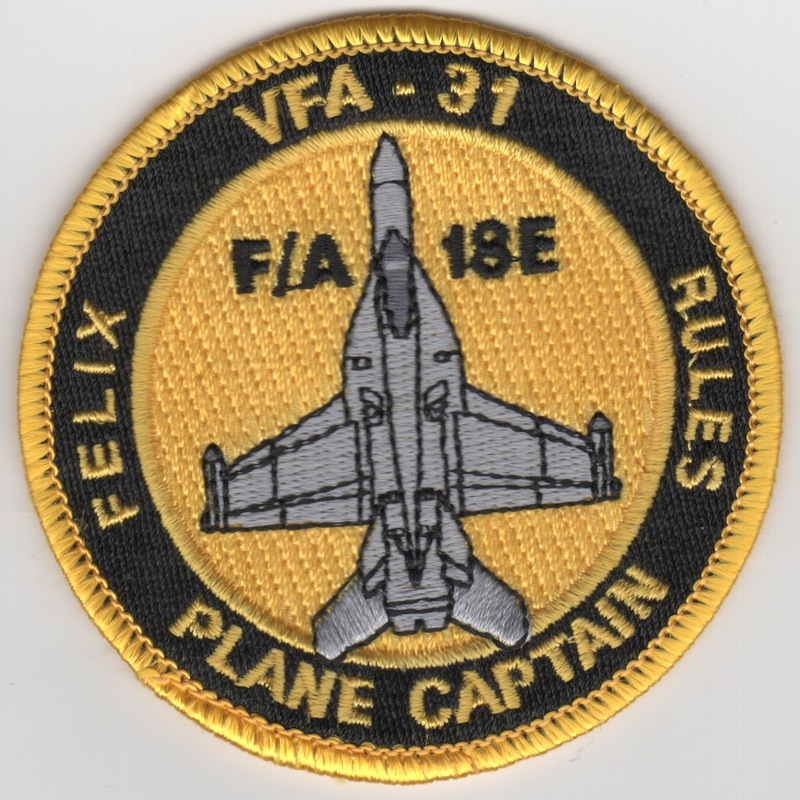 This is the yellow version of the current squadron patch for VFA-31. 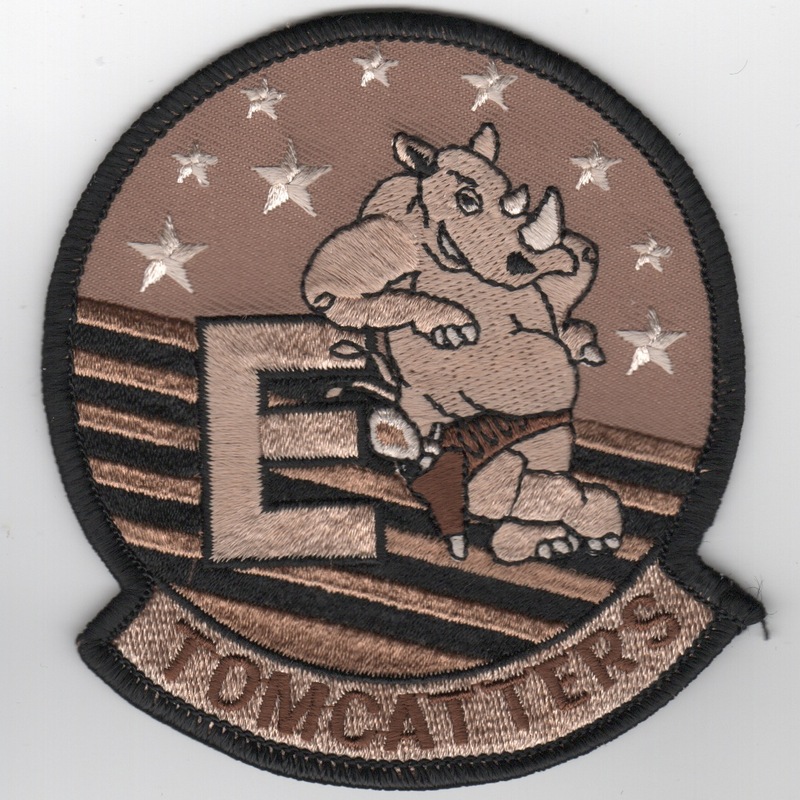 The "Tomcatters" are the second oldest Navy fighter squadron dating back to VF-1B on July 1935. They flew the F-4J Phantoms until transitioning to the F-14D Tomcat in January 1992, eventually transitioning to the F/A-18 Hornet. They pioneered the use of the TARPS pod for reconnaissance missions and participated in the Lebanon and Syrian conflicts, the latter of which they were engaged by hostile AAA and missile fire. This is the color version of the current squadron patch for VFA-31. 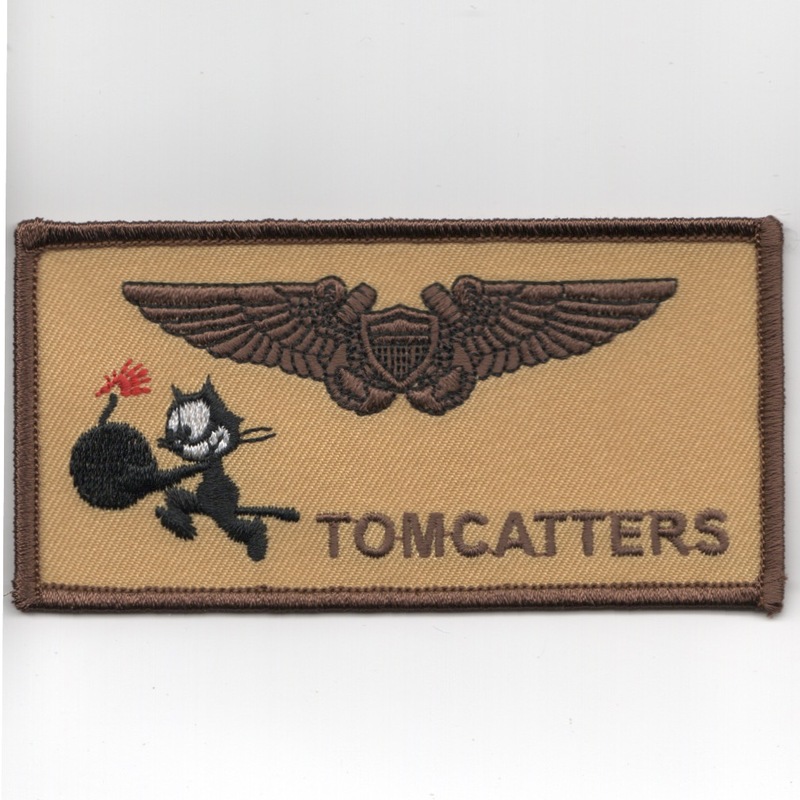 The "Tomcatters" are the second oldest Navy fighter squadron dating back to VF-1B on July 1935. They flew the F-4J Phantoms until transitioning to the F-14D Tomcat in January 1992, eventually transitioning to the F/A-18 Hornet. They pioneered the use of the TARPS pod for reconnaissance missions and participated in the Lebanon and Syrian conflicts, the latter of which they were engaged by hostile AAA and missile fire. 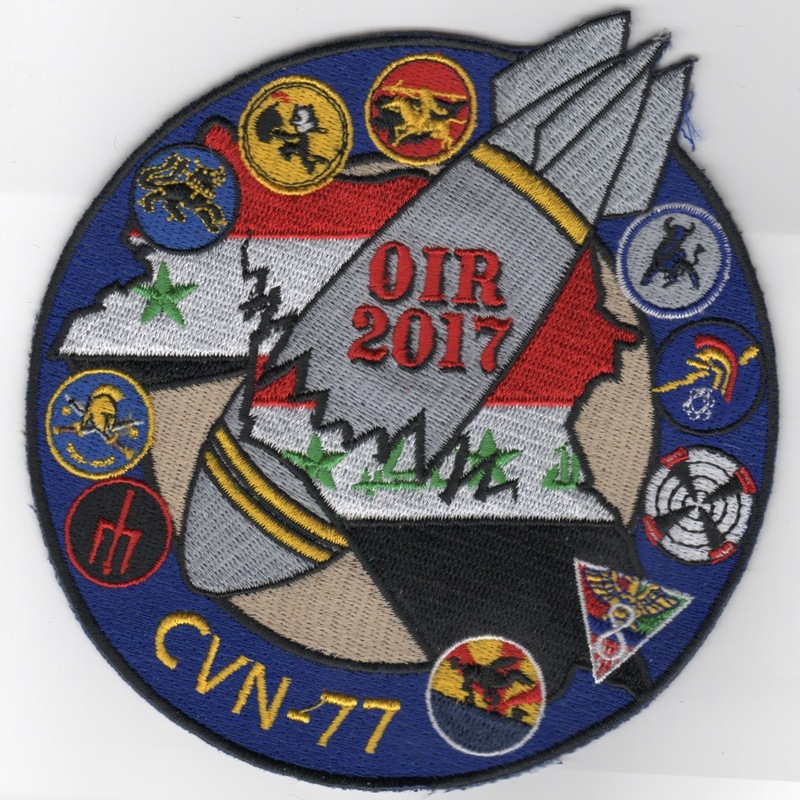 This is the 2017 OIR cruise patch created for VFA-31 while onboard CVN-77 for their tour over in "the box". This patch depicts a MK-84 bomb going thru the Iraqi flag. All the logos of the squadrons in CVW-8 are also shown along the edge. This patch does not come with velcro attached. 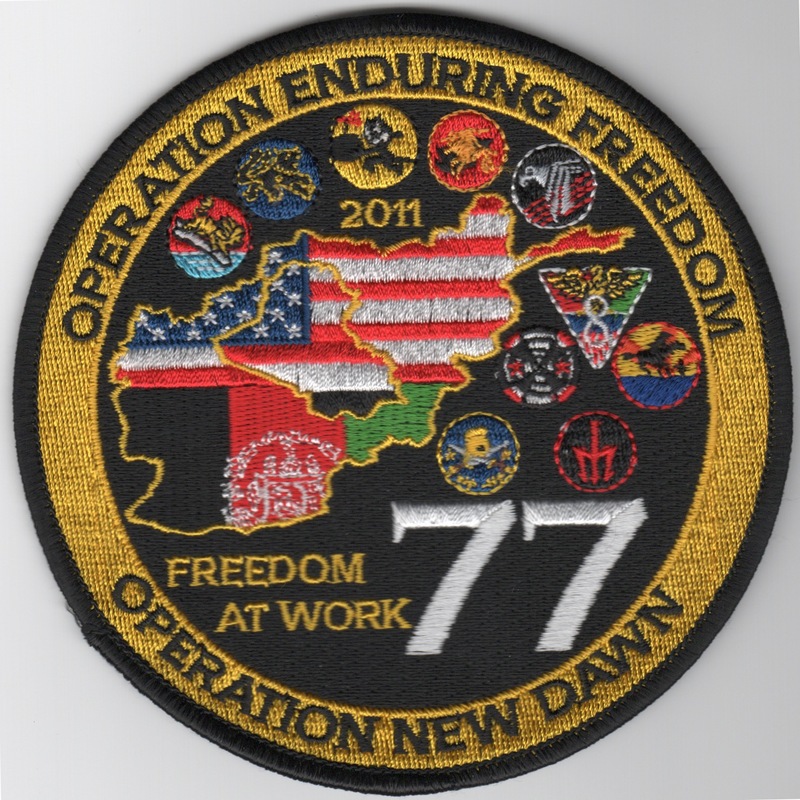 (Obtained from the Squadron): This is one of the 2011 cruise patches for VFA-31/CVN-77/CVW-8 for their Op NEW DAWN/Op ENDURING FREEDOM Cruise. It shows the squadrons attached to CVW-8 and says "FREEDOM AT WORK" near the bottom. This patch does not have velcro attached! This is the red Felix shoulder patch for the VF-31 "Tomcatters" out of NAS Oceana, VA. It is worn on the right shoulder sleeve of the flightsuit by the aviators in the squadron. 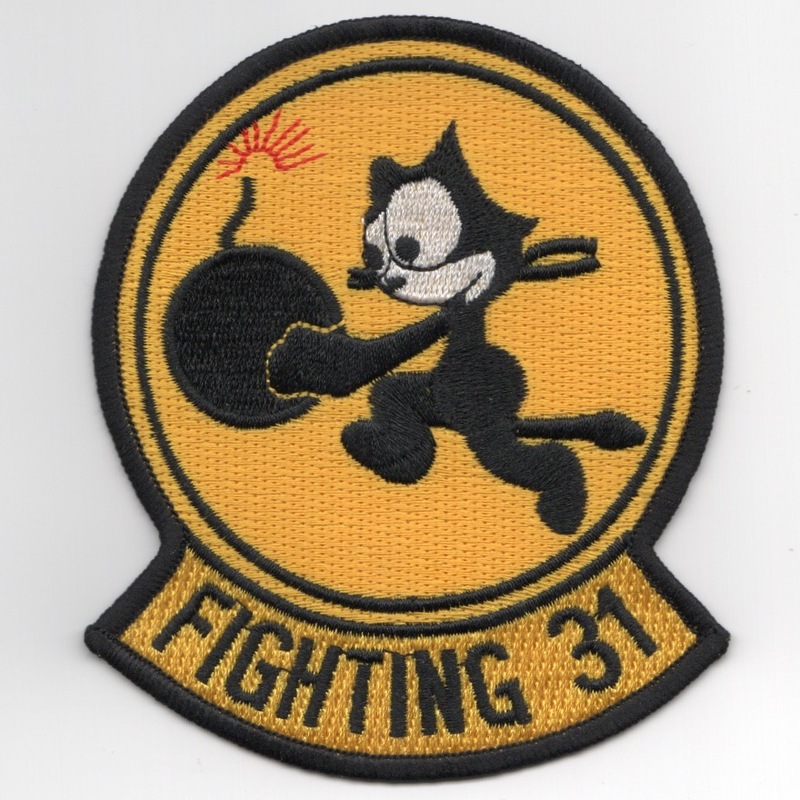 This is the desert version of the current felix patch for VF-31. 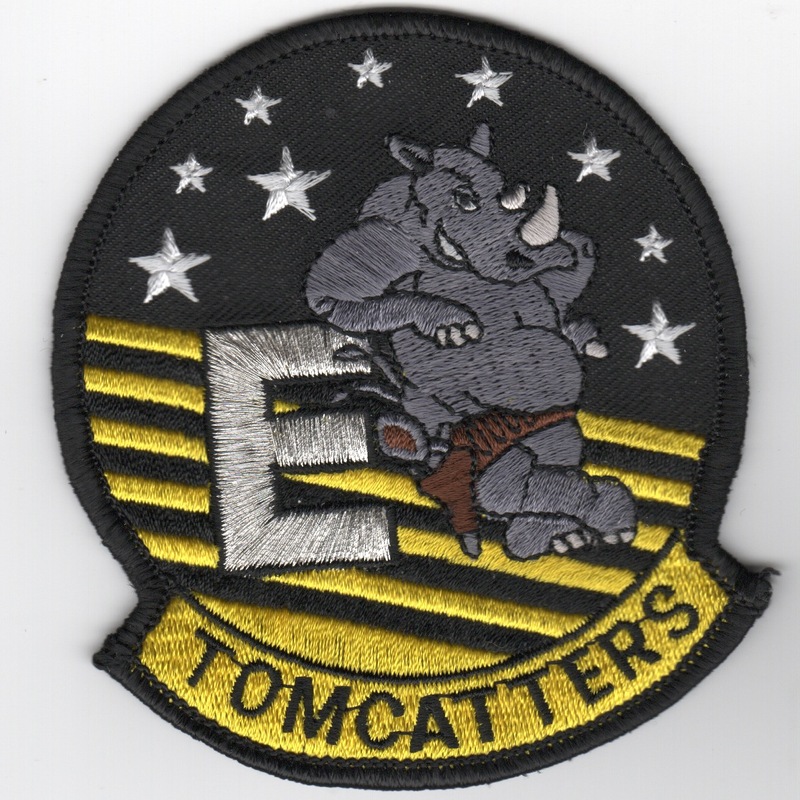 The "Tomcatters" are the second oldest Navy fighter squadron dating back to VF-1B on July 1935. They flew the F-4J Phantoms until transitioning to the F-14D Tomcat in January 1992. They pioneered the use of the TARPS pod for reconnaissance missions and participated in the Lebanon and Syrian conflicts, the latter of which they were engaged by hostile AAA and missile fire. These are the "everyday" black nametags for the pilots for VFA-31. These are the "everyday" black nametags for the RIOs for VFA-31. These are the "Friday" nametags for the pilots for VFA-31 that have the squadron insignia on it. These are the "Friday" nametags for the WSOs for VFA-31 that have the squadron insignia on it. (Another AV8RSTUFF Creation): This is the desert nametag used by the pilots for VF/VFA-31 with 'FELIX' carrying a bomb (their logo). This patch does not come with velcro attached so that it can be embroidered. For a small fee, I can get them embroidered for you. 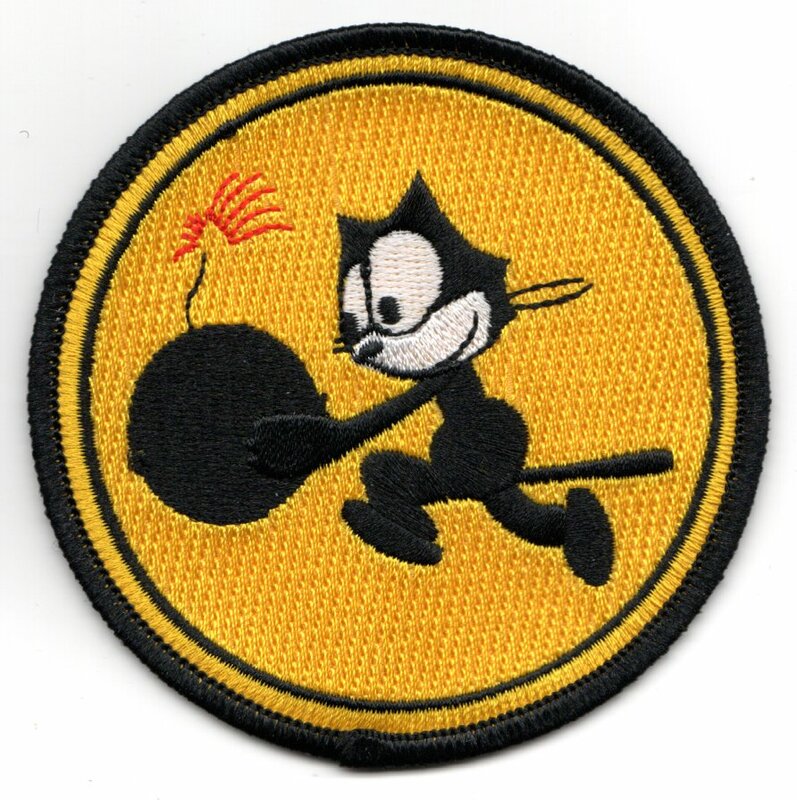 (Another AV8RSTUFF Creation): This is the desert nametag used by the RIOs/WSOs for VF/VFA-31 with 'FELIX' carrying a bomb (their logo). This patch does not come with velcro attached so that it can be embroidered. For a small fee, I can get them embroidered for you. (Another AV8RSTUFF Creation): This is the desert nametag for VF/VFA-31 pilots that has their squadron name 'TOMCATTERS' embroidered on it. We used to have these "generic" nametags made so that when we were in port or at the club, it would mess with those that didn't know us.....gave us some anonymity as well!! It has their log of 'FELIX' carrying a bomb (their logo) and does not come with velcro attached so that it can be embroidered. For a small fee, I can get them embroidered for you. (Another AV8RSTUFF Creation): This is the desert nametag for VF/VFA-31 NFO/WSO's that has their squadron name 'TOMCATTERS' embroidered on it. We used to have these "generic" nametags made so that when we were in port or at the club, it would mess with those that didn't know us.....gave us some anonymity as well!! It has their log of 'FELIX' carrying a bomb (their logo) and does not come with velcro attached so that it can be embroidered. For a small fee, I can get them embroidered for you. (Obtained from the squadron): This patch is the black/yellow version of the aircraft "bullet" patch worn on the left sleeve of the flight suits by the guys/gals who fly the F/A-18E Hornet! This patch says "FELIX RULES" on the sides and does not come with velcro attached. This patch is the desert version of the aircraft "bullet" patch worn on the flight suits by the guys/gals who fly the Hornet while in the "combat theater"! 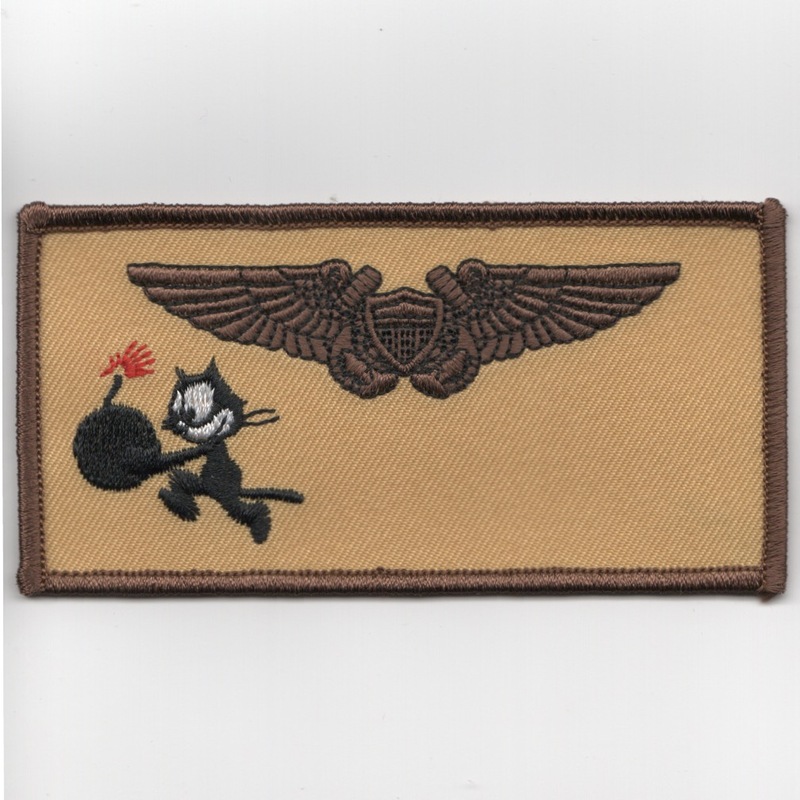 This patch is the color version of the 'homage' to the Tomcat Felix patch worn by all the Tomcat flyers over the years. This version of the felix shows the "Rhino" leaning against the "E" indicating that VFA-31 is flying the F/A-18E! This patch is the desert version of the 'homage' to the Tomcat Felix patch worn by all the Tomcat flyers over the years. This version of the felix shows the "Rhino" leaning against the "E" indicating that VFA-31 is flying the F/A-18E! 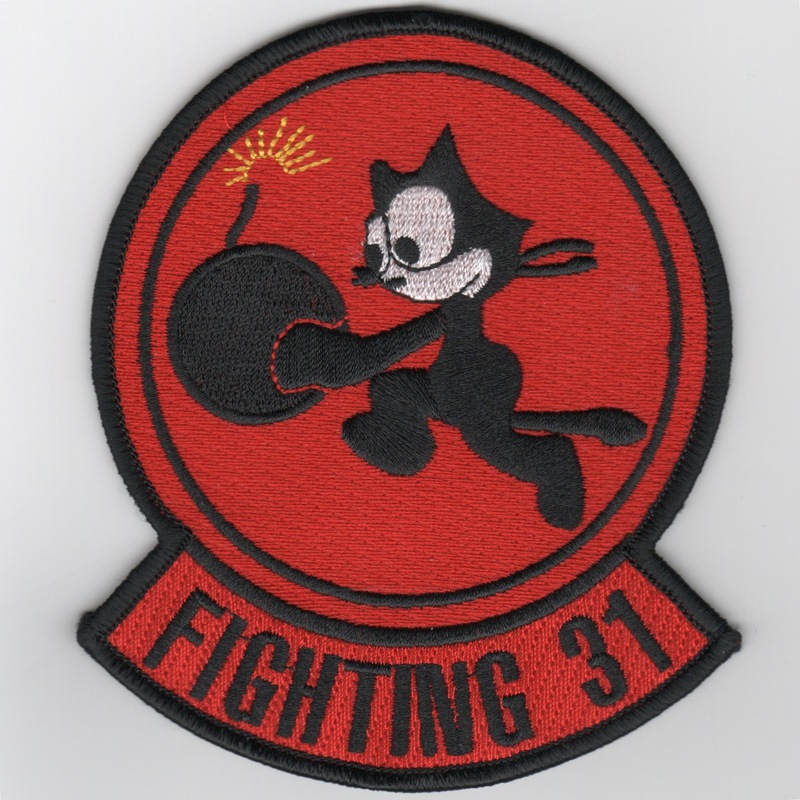 This patch is the color version of the 'homage' to the Tomcat Felix patch worn by all the Plane Captains over the years. This version of the felix shows the "Rhino" leaning against the "E" indicating that VFA-31 is flying the F/A-18E! 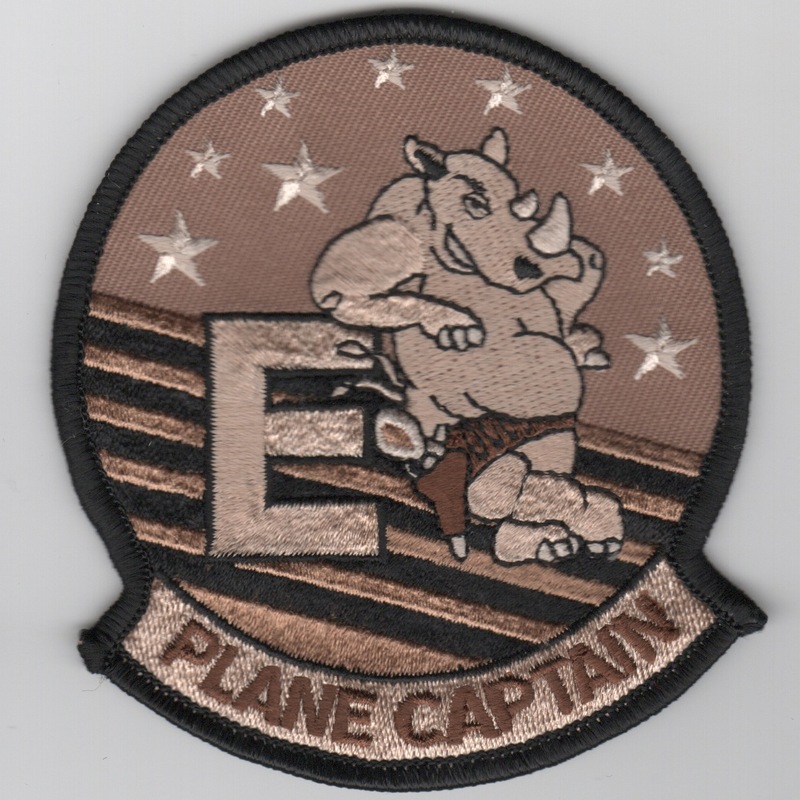 This patch is the desert version of the 'homage' to the Tomcat Felix patch worn by all the Plane Captains over the years. This version of the felix shows the "Rhino" leaning against the "E" indicating that VFA-31 is flying the F/A-18E! 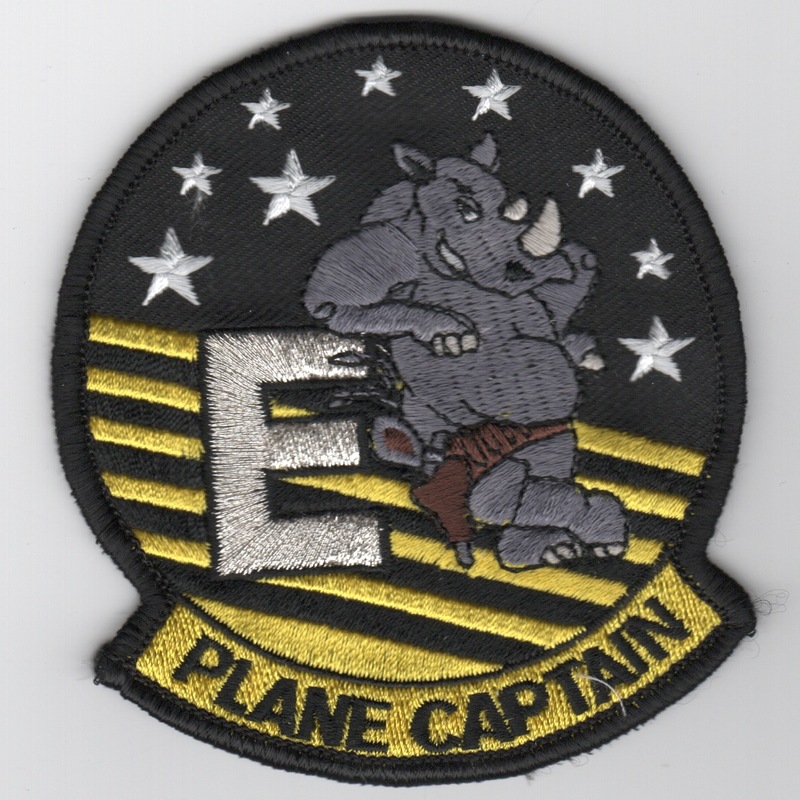 This patch is the round/yellow Plane Captain patch created for those that maintain the aircraft! Without them, we'd never get a jet in the air or off the deck! This is the round, orange version of the new VFA-31 Weapons Platform F/A-18F patch created in 2005 depicting their transition to the Hornet in Fall 2006. 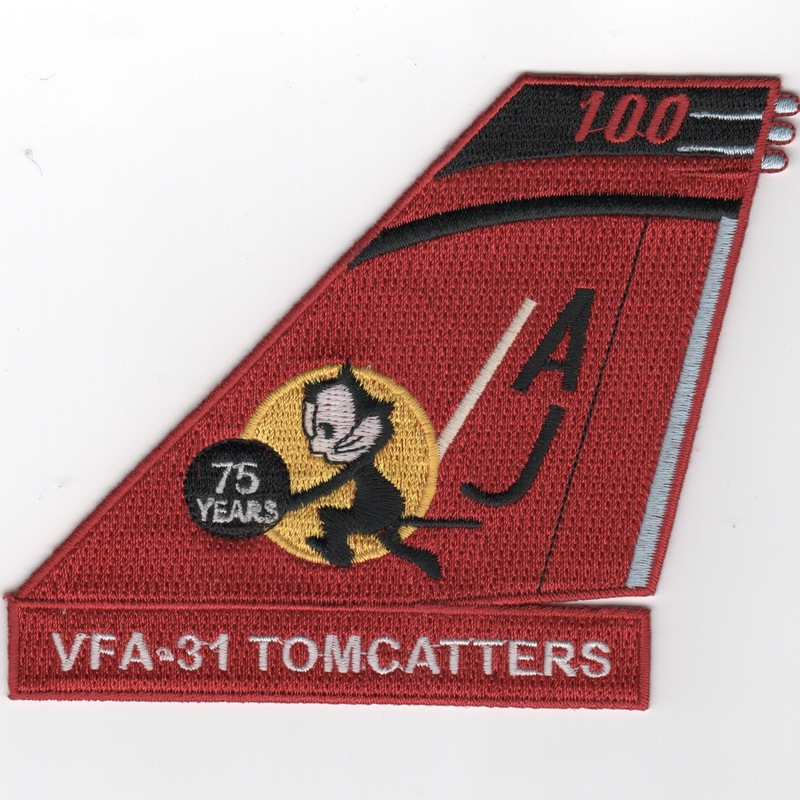 The "Tomcatters" are the second oldest Navy fighter squadron dating back to VF-1B on July 1935. They flew the F-4J Phantoms until transitioning to the F-14D Tomcat in January 1992. They pioneered the use of the TARPS pod for reconnaissance missions and participated in the Lebanon and Syrian conflicts, the latter of which they were engaged by hostile AAA and missile fire. This is the round, black version of the new VFA-31 Weapons Platform F/A-18F patch created in 2005 depicting their transition to the Hornet in Fall 2006. 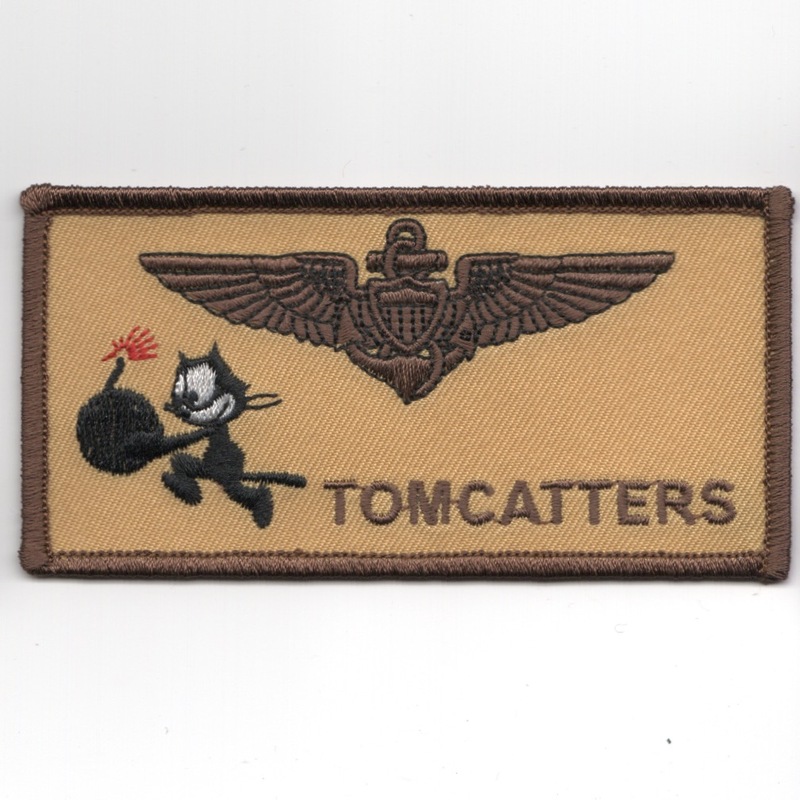 The "Tomcatters" are the second oldest Navy fighter squadron dating back to VF-1B on July 1935. They flew the F-4J Phantoms until transitioning to the F-14D Tomcat in January 1992. They pioneered the use of the TARPS pod for reconnaissance missions and participated in the Lebanon and Syrian conflicts, the latter of which they were engaged by hostile AAA and missile fire. 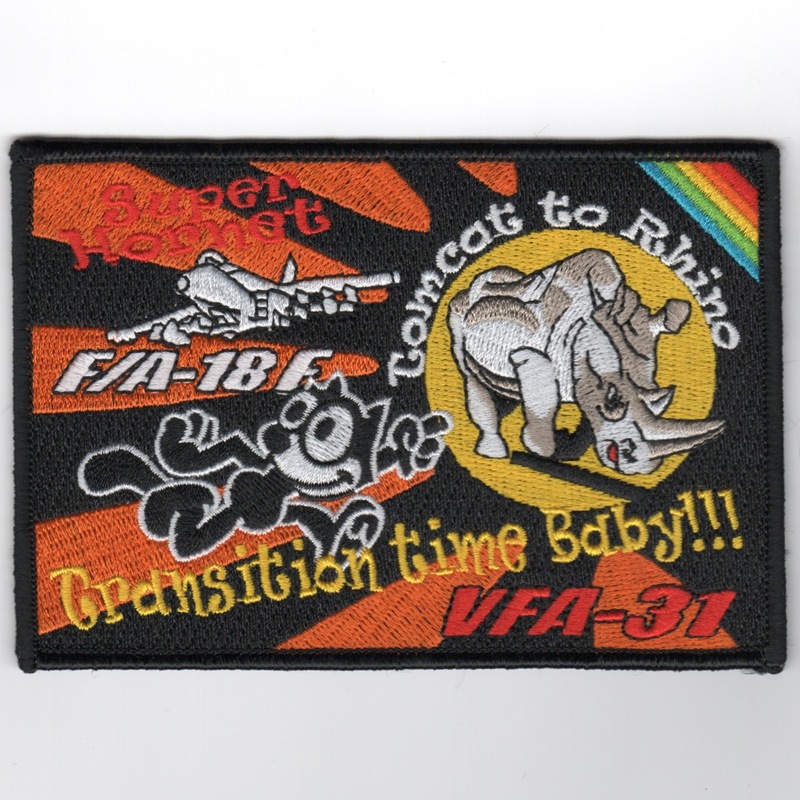 This is the rectangular, orange version of the new VFA-31 Weapons Platform F/A-18F patch created in 2005 depicting their transition to the Hornet in Fall 2006. 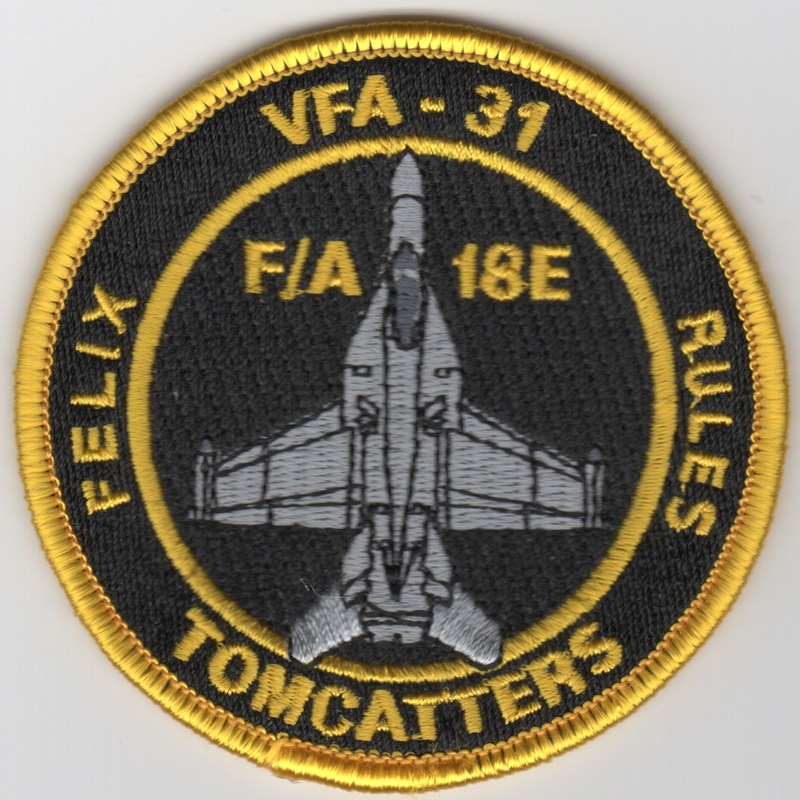 The "Tomcatters" are the second oldest Navy fighter squadron dating back to VF-1B on July 1935. They flew the F-4J Phantoms until transitioning to the F-14D Tomcat in January 1992. They pioneered the use of the TARPS pod for reconnaissance missions and participated in the Lebanon and Syrian conflicts, the latter of which they were engaged by hostile AAA and missile fire. We just moved (2018) into a new warehouse and found our "missing" box of Japanese-made patches that had been long-lost! Get one while supplies last.....this patch does not have velcro. Homepage | Order VFA-31 Patches!